As you can see, when it comes to 1-minute sustained wind speed, Irma ranks tied for second place (with four others) when it comes to North Atlantic hurricanes. In terms of intensity (the lower the air pressure the higher the intensity), Irma doesn’t even crack the top 10 in the North Atlantic (it’s 12th). How does the mainstream media get away with this? 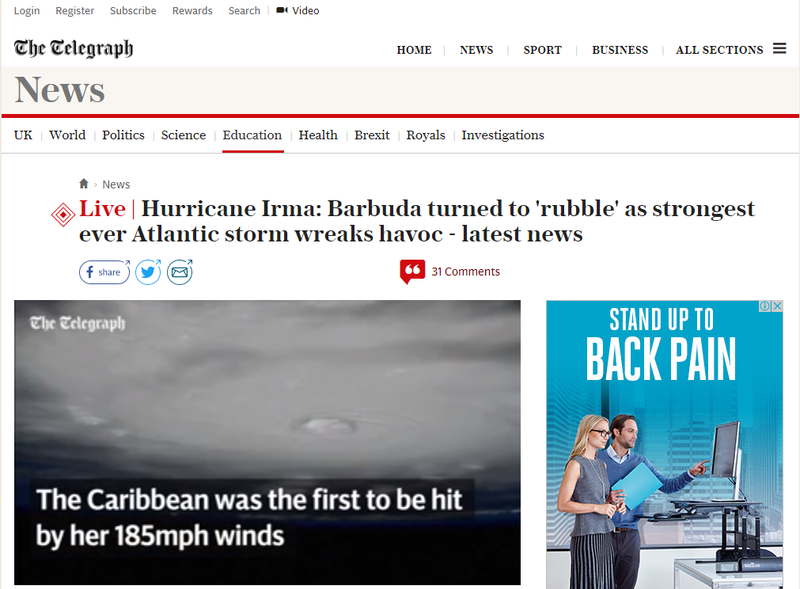 It’s a terrible indictment that whenever there is a cyclone or hurricane these days, it’s almost certain that the media will make a false pronouncement that its either the ‘worst ever‘ or that ‘we’re getting so many more of them because of global warming‘. Is it any wonder that the public no longer trusts the media? Or, in the case of the Guardian, why nobody wants to part with their money to buy their slop – to the point where they have to beg for money? This entry was posted in Global warming and climate change policy and tagged Bad Journalism, climate change, global warming, Hurricane Irma, Seriously - Do You Guys Get Paid For This?, Ugly Journalism, Unethical Journalism. Bookmark the permalink. It is important that the shoddy reporting is highlighted whenever possible. These clowns have no shame. Unfortunately they still carry readership. It would be unprecedented for the latest hurricane to not be the worstest eva. The reason the Graniaud refuses to put up a paywall is that its zombie leftard readership will not pay for its “journalism” — that is, its “journalism” is worthless. Therefore, the joint is going broke at a rate of $A50-$A100 million a year because it refuses to come to terms with the media landscape in the digital age. When it comes to weather and climate, it would rather keep publishing hysterical CAGW propaganda like the above that only its incurious, diseducated readership will believe. In the media business, it is a laughing stock because it doesn’t report news – just narratives. Leftards destroy any media business they are allowed to dominate free of ethics — and currently that’s about 75% of the world’s newspapers and TV stations/networks. Hurricanes Harvey and Irma are no joke. I am sorry for the people in Barbuda and elsewhere in the Caribbean who have lost their dwellings and loved ones. We may be returning to the phase of the ~60 year cycle which saw terrible hurricanes like Hazel, during the very destructive 1954 season. Of course you will not hear about the ~60 year cycle from the MSM or the government climate science sector since that would imply CO2 is not evil. Dilley had predicted a harsh hurricane season already back in early February, long before most forecasters were ready to go public with their forecasts. … So far his predictions for the current season have been impressively accurate. Dilley says he is tracking 4 historical analog years that are like the 2017 season, noting that hurricane patterns have a strong tendency to repeat in cycles. Another day, another world-ending apocalyptic catastrophe from the Leftard propaganda activists at the B.o.M. (Bureau of Mendacity). Todays’ weather is Armageddon, with a chance of killer Cyclone, Noah’s flood, lethal drought, searing heat and freezing cold. THEY say it wasn’t like that before gerbil worming. I say it wasn’t like that before some idiot left the asylum gate open and let all the nutters escape into the Bureau of Mendacity and the C.S.I.R.O. (Crap Science Inspired by Religious Oratory). You can REALLY trust the Australian LIARS’ Party propagandist weather bureau. Bull Shitten personally guarantees the accuracy of EVERY Leftard word. Young people love to hear that they are smartest most tortured young folks evah, and they live in most terrible times evah. Reinforcement for the Eloi is the game. It seems hurricane (tornado, cyclone) intensity measurement techniques have changed over time. Pre-satellites planes flew through the eye to directly measure the pressure and wind speeds but now a safer method is used with satellite imagery and computer modelling where the intensity is estimated, so comparisons over time are dodgy, IMO. Your wish is my command, man alive. The eye crossing is from the two minute mark. Awesome. I would really like to know why BoM or geoscience Australia isn’t set up to do the same, because I reckon some of the last few cyclones on coast crossing did not reflect the strength indicated by Dvorak modelling. Also, most decent modern planes could fly through a hurricane.. they already fly faster. A tornado would be a different story though! Irma is certainly not the worst eva, but it is really, really bad just the same. This will kill a lot of people. Craig, I too dip into the G Spot for humorous relief. But the hidden treasure is the jewel mine of the comments threads. There are some seriously unhinged Leftards on those bad boys. Unreconstructed torturing and murdering kommisars, senior cadres, gulag guards and ‘made their bones’ Stasi agents. A human zoo of the autodigesting coprophiles that make up the Left. Truthist use of charts and graphs is one thing, but what really matters is that there is a progressive feeling that the weather simply and literally feels like it is the worst it has ever been, right here, right now and happening to them–because of Trump. Everybody who locked themselves in their toilet with their kids and howled in hysteria when Trump won now feel completely justified, because of the weather he makes. unusual weather, said the chief meteorologist at Sydney’s Weather Bureau (Mr. J. Hogan). Hmmm, I wonder who has the greatest chance of survival. The poor or the (relatively) “rich”. The global warmenists are at war with both groups. The poor, they would like to see poorer and more numerous. The rich, they see as immoral (how dare they improve their lot) and would like to convert them to the former group as quickly as possible. Supporting policies that impoverish people ensures more of them will die. How all “humanitarian” of you. 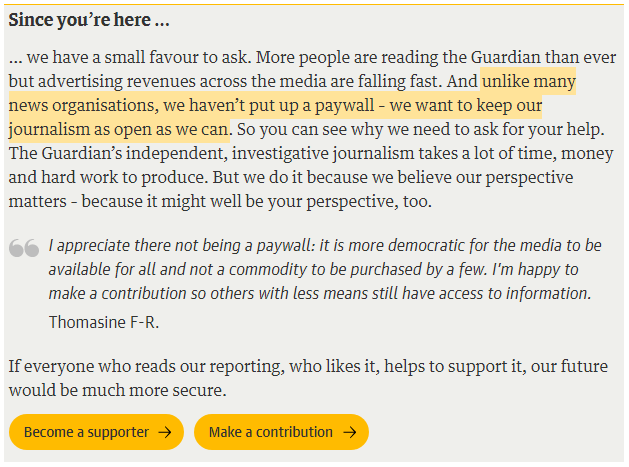 The only reason to read Teh Grauniad is the minor feeling of satisfaction from ignoring that “Pleeease pay us for this crap” message. That and the Ottolenghi food column. So Fake News eh? Who’da thunk it? Bear, I’ll admit to reading the Gruaniad’s football and rock music pieces occasionally – and agreed, the end message always makes “mah feelz” a lot better. Fine dining for the egregiously coprophagous “progressives”. Global warming is the cause…………………. of the most hyperbolic claims by global warmists – ever in the history of the world EVER. Yet they are totally silent about the fact that over the past decade or more there have actually been fewer cyclone events hitting the USA – ever in the history of the world EVER. Yes, once again global warmists have jumped the shark with their claims. In fact they have jumped higher – ever in the history of the world EVER. you’ve got to love kermit hanging from the ‘rear view mirror’. I’ll just keep reading the gairdian for free until it goes broke. Hurricane hunting via aircraft is alive and well. There is a US Air Force reserve squadron dedicated exclusively to this mission. Time lapse video of hunting Irma.